Last night I held the last session in what I’ve been calling the ‘Wild Yoga Experiment’. It’s as much a beginning as an ending, and the work will continue in as yet unseen ways. But it was a good opportunity to reflect on the project so far. We had some difficulty expressing the nature of what is different about these Wild Yoga sessions, compared to either a normal class or workshop. Helen said that usually, her preferred environment for a profound experience of practice is a weekend or more, away on retreat. A number of us shared the common experience of attending and very much enjoying these kinds of workshops, and returning to our daily lives fired up with the enthusiasm to transform some key aspect of our lives, or start some nourishing new practice, only to find that the impulse for change fades. This is a known issue for many spiritual practices. And yet these sessions, despite only being a couple of hours long, felt much more profound in the moment than a standard class; and also more profoundly transformative than a weekend retreat. We wondered why, and talked about the repetition of the sessions – keeping a simple format over the months; and about the elusive ‘flow’ state, where there is enough challenge to absorb attention, but not so much that action becomes stressful. This is very exciting to me, especially as in many ways, I find these easeful sessions to facilitate, for the same reasons. They feed and nourish me, and the fact that they are always different and surprising even to me, helps them be ‘fresher’ than a standard class where I am the source for all themes and movements. This does not mean that they are ‘easy’ to lead. It has taken some courage to allow ‘students’ to lead others under my guidance. There is a strong taboo in many alignment-based yoga systems for this kind of work, and many grave warnings given about how people will get ‘hurt’ if they are allowed to find their own safe range of movement. I have spent a few years now challenging the idea that yoga teachers are the experts on the bodies of others, having seen too many injuries from ‘aligned’ practices, and spent too many hours in ecstatic dance practices, whirling like a happy dervish, and watching others find ease in their own bodies without the internalised fear of mis-alignment. And yet, I am watching what the participants do, how comfortable they are with what is offered to them by others. 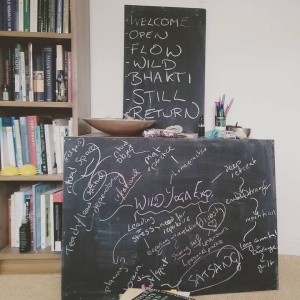 I would intervene if I felt the ‘Flow’ and ‘Wild’ parts of the practice were taking a turn I felt wasn’t healthy: either too fast, or too difficult, or if people were obviously struggling to keep up. I still hold the space, and weave the session from the elements that are brought to it. But let us not forget that we are all moving, all of the time, without anyone to tell us how. This is the logical extension of my commitment to a teaching of yoga more influenced by primal and functional movement theory. One seemingly inescapable issue with the experiment’s format was the long-term nature of the project. As ever, one makes an honest and serious commitment to be at most, if not all of the sessions, only to find that over the months, life gets in the way. Despite this being a feature of every long-term course I have ever participated in or led, it is worth mentioning, because here, there was a high level of personal investment in the process by a number of people, who then dealt with feelings of guilt at not being available for more sessions. For my part, I can only say that I am humbled by even the aim to commit to this very experimental plan, and the trust in my teaching that demonstrates. Over the summer, I will be experimenting with one-off sessions, which won’t have the same commitment, which will be very different, and therefore interesting. Come the autumn, I would like to find a way to continue playing wild together that is sustainable for all of us with all our busy lives and unexpected life events. The combination of Vinyasa sessions, and the Satsang to discuss them, has given us a rare chance to discuss our practice and its emotional, even spiritual impact. At this Satsang, the group agreed that part of the wonder found in the sessions was the beautiful diversity of ways of moving; and the equal diversity of experiences found within it. Discovering what we share, and what we hold in common; as well as how we differ, has been overwhelmingly positive for everyone. There has been little sense of needing to compete or critically compare. I hope in all humility that this is in part due to my own commitment to teaching spaces that honour diversity and practice accessibility; and how that has been modelled for me by my own inspirational teachers. Part of the diversity of experience that we discovered in our discussion was our own attitude to the Satsang sessions. For some of us, including Sue, there is a clear split between brain and heart; logic and intuition. For some of us, Vinyasa practice drops us out of logic and into an intuitive state of being that feels too specific and fragile to be disrupted by discussion post-practice. For these people, a separation between the sessions makes sense. For others, including Jill, mind slides much more naturally from logical understanding of the themes, into the embodied experience of them in practice. For Jill, therefore, Satsang discussion of the theme could productively begin a combined Satsang > Vinyasa session. For still others, Satsang is a space to reflect on the theme as it has been experienced, and would more naturally come afterward. Personally, as long as the shift from one to another is clear, I can navigate it. This might be because I have many years of experience working with, and understanding, trance states of all kinds, and the Vinyasa ‘flow’ state is just that – a light trance. But this did connect us to another aspect of our diversity: how much or how little we prepared for the ‘leading’ sections of the practice. Often, preparation of a sequence for the ‘Flow’ section was set aside in the moment for a more emergent sequence of movements. I can say that this is something I hope to gently nudge participants towards: a flow of movements and holds that arises from the beauty of the given moment, responsive to the circle, and to the many seen and unseen spirits of place. Eventually, in meeting regularly, each group of ‘Wild Yogis’ should develop a shared culture and repertoire of movements, individually expressed. That prospect is truly exciting for me. Most of our discussion orbited around, and returned to the centre of ‘leading’ others in flow. Sue was not alone in finding this part of the sessions a challenge. I am committed to it – it is the heart, soul and centre of the experiment. It attunes us to each other, and in the process, to ourselves. This shared, democratic sense of movement, is an unseen lack in the centre of most teaching experiences of movement. Helen said, and we mostly agreed, that part of the problem is the novelty of it: that apart from Russ and myself, and a couple of other participants, the group are not used to leading others in movement. Although this experiment has run for months, with absences here and there, most participants have made it to three or four Vinyasa sessions only. It is probably true that the practice is easier with a personal repertoire of sequences and movements. Indeed, part of its challenge is to help participants to reflect on what they already know how to ‘do’, rather than relying on a teacher to guide them through every choice of movement. How it plays out with beginners will be interesting to discover. For now at least, I feel happier asking for participants to have a bare minimum of a few months of yoga under their belts before attending. This is also so they have a familiarity with the kind of light trance and sense of honoured or sacred space that we practice in. But Sue teaches dance, and is familiar with free movement styles of teaching. And when we discussed it more, it became apparent that what is shared here is more personal, and therefore more revelatory than in a teaching environment or a student role. For some, this felt like a slightly uncomfortable exposure. For Russ in particular, this was a self-revelation to be celebrated. The level of ease of each individual with leading flow will vary, but we feel that even when leading is uncomfortable, it is still worthwhile; still a profound experience. What is changed here, for anyone whose familiarity with taught movement practice mostly comes from a yoga studio, is the role of the teacher. Helen needed clarity as to whether participants were stepping into the role of the teacher by leading. It is vital to affirm that they are not. It is, as teacher/facilitator, my role to hold the space, and the circle of participants, as safe as I am able. It is my role to gently guide the process through a given theme to a specific experience; no matter how many people may take a lead along the way. There is a huge amount of preparation to these simple sessions; and I have to be more present in the experience than in any general or even special needs session that I teach. Just because I’m not acting all the parts myself, does not mean I have stopped directing the play. The fact that yoga teaching is usually so prescriptive is bound up with multiple and complex issues of authority and safety, transgression and redemption; heavily influenced by our personal memories of mainstream education. When you learn almost any other physical, creative practice, you expect to find your own way, to make your own mistakes; even when under the protective gaze of a teacher. To have a physical-spiritual technology such as yoga, that is so strongly associated with themes of liberation, delivered through micro-managing the bio-mechanics and creative expressions of each of its participants, is quite odd, when you think about it. But it is telling that we so associate yoga teaching with being told exactly when and how to move, that for a student to even choose what asana to perform next is seen as an abdication of the pedagogical role. I believe that this micro-management of the student experience, that can go as far as telling students how to feel and experience the practice, goes a long way to explain the co-dependent nature of much modern yoga practice. I am not alone in this conviction. If your yoga is firmly associated with the voice of a teacher to tell you how to move, how can you ever develop a home practice? And if there is no home practice, long term, then the burden of holding such complete responsibility for the practice of dozens or hundreds of students is surely too much for many teachers to honourably bear. I take my own cues for how the role of teacher can develop from many sources. I am lucky to have a Master’s degree that gave me both theory and experience in informal, community developing, empowering group work. I have many years of experience of led free movement in dance and martial arts; as well as many more years holding sacred space in rite and ritual. And in the last few years, I have also been lucky to find styles and teachers of yoga that hold to similar principles of reverence for democracy, inner wisdom, the circle as space of miracles, and sacred ecology. I must be honest and point out that this is because I was searching for them. We are not alone in this experiment, but neither are we commonplace. I am really looking forward to sharing this way of working with other people, particularly my sisters in the Womb Yoga and Shakti Dance communities. In fact, the ‘Flow’ parts of the sessions, when students lead the circle, are quite short. Much more time is spent in the other parts of the practice. There was less need to debate the nitty-gritty of these, but that doesn’t mean they were held to be any less important. It has taken some courage for me to schedule prayers into a session with the label of ‘yoga’; even if I know the students and the prayers themselves are inclusive and non-denominational. I am so happy with how these have been received. They are familiar to me, but less so in yoga as a whole, having simple, follow-along forms such as “I honour and name…[e.g. the warm grass underneath me and the shady trees that frame this circle]…”. Naming and welcoming each person to the circle. Honouring the spirits of place. A chant to honour our own inner wisdom. A led, but quiet warming of each part of the body, framed as a series of invitations rather than instructions. Leading by turns; sharing practice into the circle. Free movement leading to stillness. Joining or listening to sacred chant. A chant to affirm community. So this is an overtly ritual practice, even as it is inclusive of a wide range of possible beliefs, religious labels and indeed, like yoga in general, does not even ask that you have a set faith or share it with others. Everything is designed to be accessible to any worldview that is tolerant of the faiths or non-faiths of others. But the overt nature of what is shared – the fact that even in an unspoken diversity of personal faith-structures, we can join hands and essentially pray together, puts it in a minority within modern yoga teaching. This is a risk that so far is paying off. There is a deep joy in this informal interfaith where atheists and animists and monotheists and agnostics of all stripes can share hopes for peace; and joy in life. To combine the spiritual and physical within one practice is deeply nourishing to many of us, especially those of us with problematic religious histories. Indeed, there was some debate as to whether this practice is spiritual (in other words, non-prescriptive, non-dogmatic), or religious (in that this is a word to be reclaimed). We talked also about the line between the rational and the irrational, and how for each of us, our levels of comfort with supernatural themes; and our level of wonder at the natural world, have waxed and waned. It is clear, though, as Jill pointed out, that the yoga mat is indicative of a more-than-mundane space. It is, indeed, a ritual object. For her, just popping into a quick asana without preparing the mind and the space for yoga felt wrong; and this has another disruptive impact on the development of home practice. Some places for yoga are more or less a constructed and held sacred space; and although I hold my yoga spaces lightly, unobtrusively, they are always sacred to me at least. The more sensitive students have always picked up on that, even as some can wander in and out without noticing, and that is fine too. Some of us come to yoga looking for a spiritual practice and find joy in the physical. Others come looking for a physical practice and find unexpected joy in the spiritual. The longer I practice, the less there is to separate them. I’m aware that many people, in the group and elsewhere, have a deep resistance to labelling their spiritual practices ‘religious’, and I share their concerns. But as a religious scholar now, it suits me to be provocative about what ‘religion’ is, and by everything I’m recounting here, this does fall securely under the scholarly definition of implicit or even lived religion. I won’t go into detail here, only to say that in Satsang our opinions differed very little on the heart and content of what we were doing; and much more on the usefulness of the label we applied to it. Also, I have a blog post discussing just this question [‘Is God still a DJ?’], which I encourage you to read if this question interests you further. One aspect to the structure and content of the sessions which I have not much discussed, is the sacred nature of creativity itself. The chanting, the moving, the offered shape of bodies, the poems read – these come together to form more than a pleasingly and innovatively diverse session. As a member of the modern druid community for well over a decade, creative expression itself is a sacred source for me. Poetry, bhakti and dance have reverent truths to tell; can take us on journeys of pilgrimage to the lives of others, and drop us into perfect moments of shared poignancy. It pleases me greatly how easily the group took to sharing such things in circles of ‘yoga’, and even more that Russ specifically honoured a rediscovery of poetry in the gifts he was taking from the sessions. We spent some time in this last Satsang of the first wave of Wild Yoga poring over, and picking out, our favourite poems from my collection of books. I encourage anyone who has taken part in the project to send me their favourite fragments of poetry, so I can build up a mini-library of them for future sessions. [Short sections are great]. For now, the experiment is over, and yet the real work begins. We are all changed by the experience – whether in our personal practice, our home practice specifically, our relationship to the ‘inner teacher’, and our relationship to the ‘community’ of yoga. All of us have gained. All of us wish we could give more than we have to the project. All of us are eager to see where it goes next. For myself, there will be an impact on the doctoral research that I can’t go into in great detail yet. We did discuss it a little last night, but I’m not ready to put it into formal words on paper (or even the internet). Some of those present have volunteered to be part of the research piloting, so I can test some practicalities and assumptions before I journey further afield. I have a busy summer of camps and teaching ahead. I will, as part of that, be taking the Wild Yoga format into a small number of sessions out in the wild, so to speak. With luck and a fair wind I’ll be running them at Space for You and Santosa; and hopefully at SuperSpirit too. I know there are many of you that couldn’t get to the last session; and many more of you watching from across the internet. You were in our thoughts too last night. I hope I can get to play Wild Yoga with you soon. And in the autumn, we shall see! If you run a studio, camp or regular class of yoga or sacred movement, and you’re interested in hosting a Wild Yoga session or a few, I’m looking to see what happens when we share this practice in other groups, so do, please, get in touch.